While some may feel the approach of spring, our grass and gardens are still below several feet of snow. Yuck! And, those constant grey skies looming over head are starting to wear on my nerves. Even the coldest (-20C), windiest, sunny day is better than a blah and dreary warmer day (and by warmer I mean -3C). Around these here parts we are in desperate need of a little pick me up. 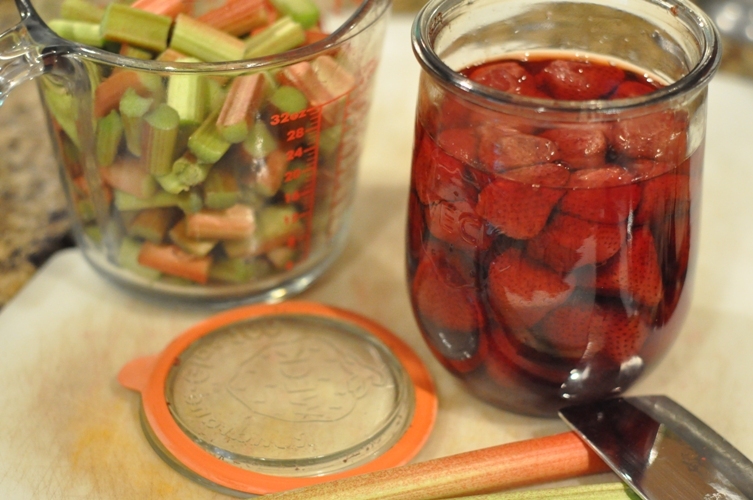 Thankfully, we have just the jars of fruit to do the job; strawberries in light syrup and frozen rhubarb. 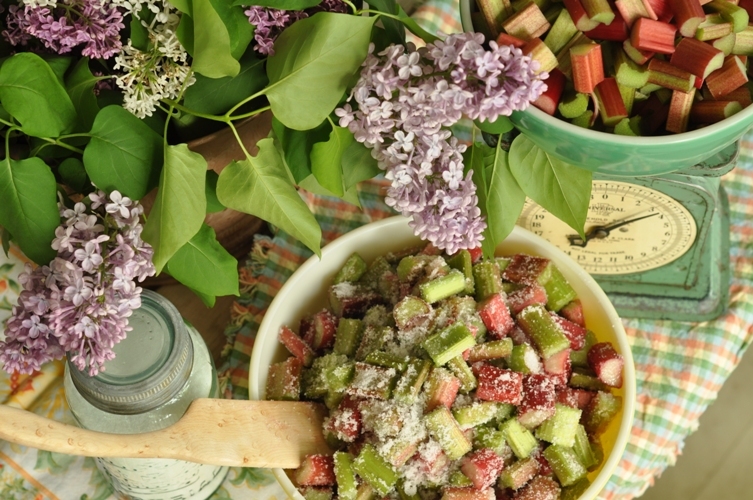 I can almost imagine the warmth of the sunny spring day we picked and prepared the strawberries and rhubarb. If there is anything to console someone with the winter blues it’s a fresh homemade pie. The smell of the kitchen brightens even the dullest spirit. 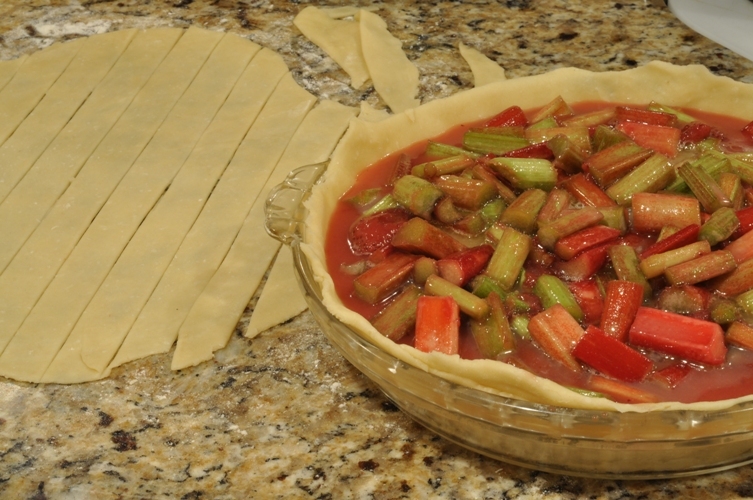 In a large stainless steel or glass bowl combine frozen rhubarb with all of the dry ingredients. Mix well making sure all fruit is well coated. Let stand in a cool place for 15 minutes. 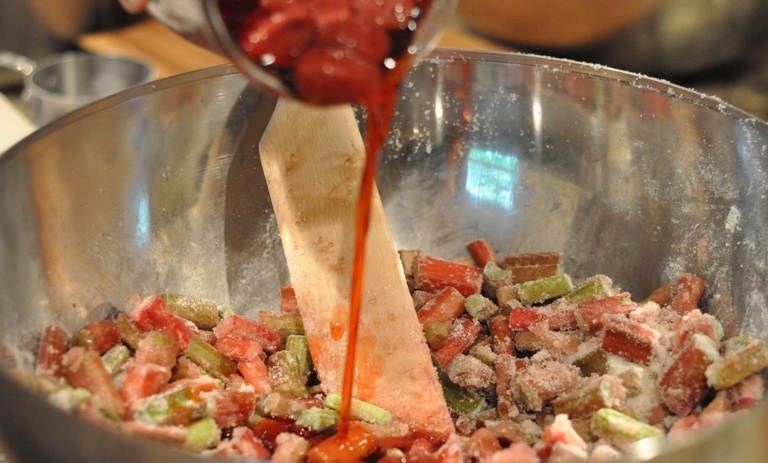 Add strawberries in light syrup to the rhubarb mixture and stir to combine. Sift together the flour and the salt. 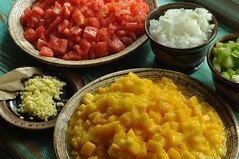 Add the vegetable shortening into the dry ingredients and blend well using a pastry blender. 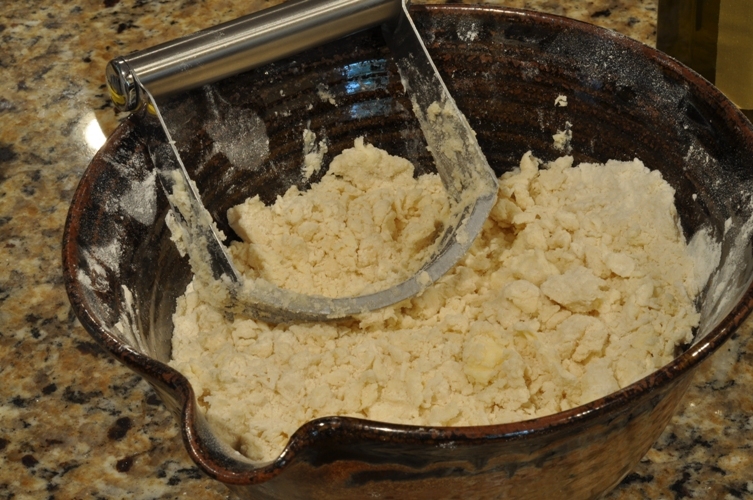 Gradually add the ice water into the dough and combine until the consistency changes and the dough just holds together. 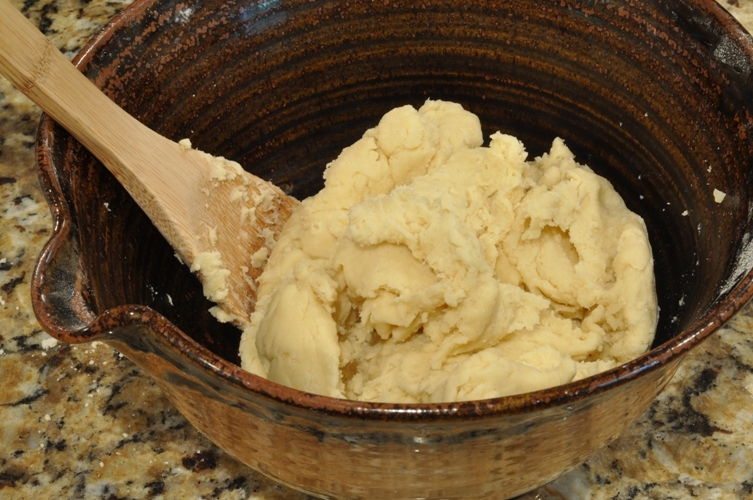 Divide the dough in half and roll out into two equal circles. Line the 10″ pie plate with the pastry dough. Pour the fruit filling into the pie plate. 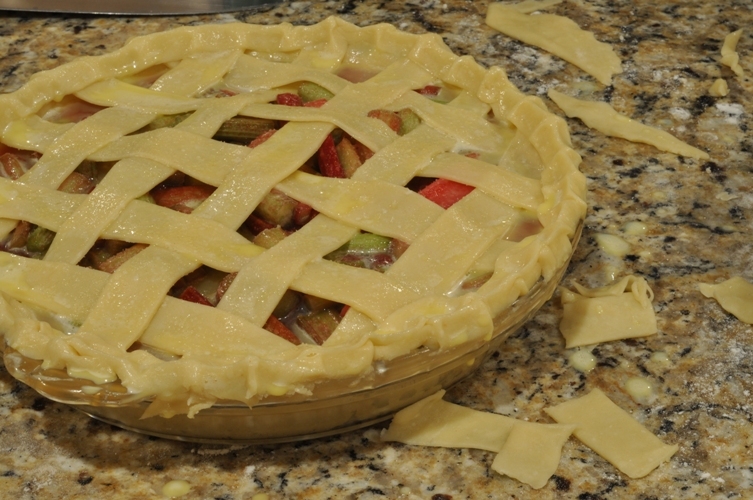 Cut the second pastry circle into 3/4″ wide strips the length of the 10″ pie plate. 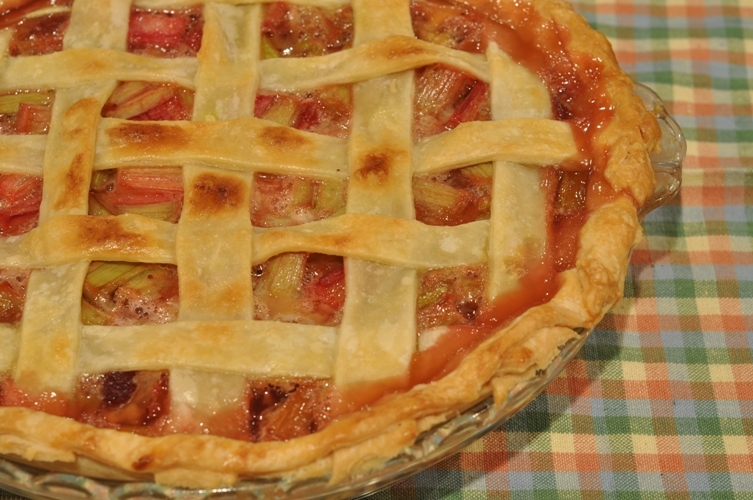 Weave the lattice top over the pie filling, trim excess dough, and pinch the edges together. Bake in a pre-heated 400F oven for 35 minutes or until the crust is golden brown. This pie will brighten even the gloomiest winter day! yum, I love it! i just planted some rhubarb – can’t seem to keep it alive. I’m dreaming of this pie!